"Rapidly flowing river" means the following stretches of river: the Kennebec River between Harris Station and The Forks; the West Branch of the Penobscot River between McKay Station and Pockwockamus Falls; the Dead River from its confluence with Spencer Stream to its confluence with the Kennebec River at a flow level of 2400 cfs or higher; the Rapid River from the outlet of Lower Richardson Lake to 3/4 miles upstream from Umbagog Lake at a flow level of 1200 cfs or higher, and the Magalloway River from Aziscohos Lake to the first Route 16 bridge west of Aziscohos Lake at a flow level of 800 cfs or higher. Anyone who seeks to work as a guide is required to obtain a Maine whitewater guide license and be employed by a licensed whitewater outfitter. These requirements are state law and are in place to protect the people of the state. 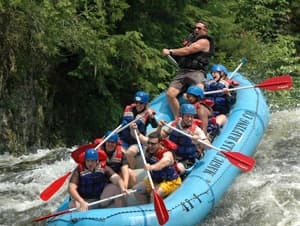 If a member of the public pays dues or fees or provides any form of compensation to a person or persons for providing whitewater-rafting services or for operating a whitewater rafting organization, the trip is commercial. A whitewater trip would also be a commercial trip if a licensed whitewater guide received any remuneration for accompanying, assisting or instructing passengers on the river on whitewater trips. It is unlawful to hire an unlicensed Maine whitewater guide or outfitter to supply a commercial trip or to hire a licensed Maine guide who is working independently from a licensed Maine outfitter. Each whitewater guide applicant must be currently certified in American Red Cross Standard First Aid or equivalent. Proof of current certification is required. Each whitewater guide applicant must be certified in C.P.R. Guide training shall include at least twenty training runs of the rivers identified in 4(b); from Spencer Stream to the Gravel Pit access point on the Dead River; from the Gravel Pit to the take-out on the Dead River; from Harris Dam to Carry Brook access point on the Kennebec River; from McKay Station to the Big Eddy on the Penobscot River (three runs of Big Ambejackmockamus Falls on the Penobscot River is equivalent to one training run, and two runs from Abol Pines to Nevers Corner on the Penobscot River is equivalent to one training run). A minimum of one guided training run from Harris Dam to the ballfield in West Forks. Each whitewater guide applicant, while participating in guide training, must comply with current whitewater guide PFD Type requirements. The minimum number of watercraft on any guide training run shall be two. The minimum number of licensed whitewater guides on any guide training run shall be two. Safety Equipment Requirements listed in Chapter 14.04 shall apply to all guide training runs. The applicant must have made at least 6 commercial whitewater trips, as a paid guide. Applicants must provide the Department of Inland Fisheries and Wildlife with a form, signed by the applicant's trainer, who is a licensed whitewater guide, stating that the applicant has taken and successfully completed the above outlined training; and signed by the outfitter, attesting that the candidate is qualified to be a licensed whitewater guide in the state of Maine. Upon receipt of this documentation, a written test will be administered. Applicants failing the written test must wait 30 days before reapplying. In 1976 State of Maine made it illegal to float logs down the Kennebec River. Prior to this, the Kennebec Log Driving Co. was moving some 300,000 cords of wood a year down the Kennebec River. Late 1970's law makers established into law the Whitewater Rafting Commission, remained in place for 15 years. Late 1970's Maine Legislature stepped in with legislation concerning PFDs and safety equipment. 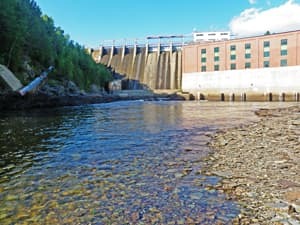 1983 Maine Legislature established the first allocation system and laws regulating commercial rafting and the amount of commercial passengers allowed on designated rivers on a particular day. System allowed for 1,000 commercial passengers on the Kennebec River per day from Sunday to Friday and 800 on Saturdays. 20,816 passengers carried down Maine's rapidly flowing rivers in 1983. 1995 Warden Service utilized Deputy Game Wardens to enforce whitewater rafting laws and rules. Whitewater Guide Advisory Board established to oversee licensing of Whitewater guides. Post September 11, 2001 - staircase built at Harris Station for recreational access to the Kennebec River. 2009 - 61,377 commercial passengers carried down Maine's rapidly flowing rivers. 2009 - Game Warden Corporal hired to the Whitewater Boating Program to enforce rafting laws and rules and assume administrative duties associated with the whitewater rafting industry. Private boaters who are whitewater rafting in Maine need to be aware of special regulations imposed by private entities (i.e. Florida Power and Light Energy) and you are encouraged to contact such companies before your trip. The Department of Inland Fisheries and Wildlife enforces the state's boating laws on private rafters as they pertain to whitewater rafting. The department does not have separate whitewater rafting regulations for private boaters. In 2007 and Spring of 2008, Maine Wardens interviewed close to 100 witnesses concerning violations pertaining to whitewater guiding.